Tag Archive | "big waves"
Rough waves on Lake Michigan. Photo from Wunderground.com by unobtrusive troll10. Enjoying the big waves has always been fun but poses life threatening challenges for many species. If you happen to be a duck you are probably safe. 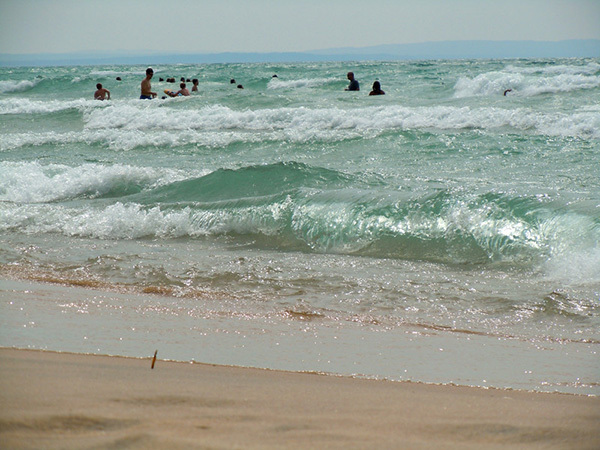 Big waves were rolling on shore at Traverse City State Park shortly after mallard ducklings hatched from eggs. The hen led fledglings to water. People concerned for the safety of the little ones approached and caused the mother to move away from young and shore. She disappeared among the tall waves with most of the ducklings but a couple lost sight of her and became separated. The people that frightened the mother picked up two ducklings and brought them to me at the ranger station. They should have left them to the mother’s care. At the beach, we could not locate the mother or her other young. One-fourth of a mile away, a stream entered Grant Traverse Bay and provided an inlet where water was calm. We took the two ducklings there and found several adult ducks with young. We released the ducklings with hope the mother was present in the protective cove. If not, the young should be safe and might join another family. The big waves did not pose a death threat to them but people causing the mother to move away from young did. When I was a “young duckling” so to speak, I had my own death threat among big waves. Our family was at a beach on a giant wave day. It was exciting and fun in the waves. I waded into the water and stood in knee deep water between waves. When a wave arrived, the water was over my head. I rode up on the wave and came back down when it passed to stand on the bottom again. All was going well until one time when I rode high on the wave and came back down, the undertow of water returning along the bottom knocked my feet from under me. I thought no big deal and stood up. It happened that I stood up in middle of a tall wave. Almost immediately the undertow knocked my feet from under me again. Quickly I stood and found myself in the middle of another wave. This repeated. By now I was out of air, frightened, and desperate to inhale. A breath would flood my lungs with water and begin the drowning process. My folks had no idea I was in danger in knee high water. They hadn’t even noticed I had disappeared. I was only underwater a short time. It seemed impossible to stand up between waves and I could not get my head into the air. Finally, I managed to get my head out of water but was knocked down by the undertow. A push off the bottom allowed me to ride up and down on a big wave. I discovered the danger of knee deep water between large waves and survived. Many people do not and several times each year, families lose a member to the power of water. It is not just people whose lives get threatened by water. Fall bird migration season has arrived. Massive avian numbers from songbirds to hawks encounter the Great Lakes migration water barrier. They pile up on the north end of the lakes on their southbound journey and move along the shoreline searching for safe crossing sites. I’ve watched hundreds of Broad-winged Hawks move west along northern Lake Michigan to go around the lake. Others moved east towards Mackinaw Bridge where crossing the straits is shorter. Once there, they wait for proper weather and wind conditions to venture safely over water. Migration over water is one of many life-threatening challenges for species in nature niches. Not all survive. I have found small birds washed dead to shore after being knocked into the water by storms or winds. People and wildlife lives depend on respect for the power of water. Have fun in turbulent water but remain safety conscious. Consider a trip to Whitefish Point Bird Observatory north of Paradise on Lake Superior to witness bird migration from Canada to the US this fall. Michigan Audubon staff can assist with species identification.